Peter Hohenstein. Image credit: Norrie Russell, The Roslin Institute. What attracted you to studying kidney development? I did my PhD in Leiden on mouse models for cancer genetics. After that I moved to Edinburgh to start working on Wilms’ tumours, a cancer of the kidneys that normally only occurs in very young children, again using mouse models. Since these tumours are the result of problems in the earliest stages of kidney development, when you study Wilms’ tumours you automatically study normal kidney development as well. We mainly study the genes Wt1 and β-catenin, since these are mutated in a subset of the tumours. Kidney development can be surprisingly well explained with the help of fish and chips. The battered fish is a beautiful piece of mesenchyme, and the chips make a great ureteric bud. In the developing kidney the mesenchyme gives rise to the nephrons, the actual filtering units of the kidney, while the ureteric bud forms the collecting duct, the kidney’s plumbing system. You can mould the chips into any shape you want to explain how the bud grows. French fries are better than chunky British chips. Since 2013 it’s been known the stromal cells also help the kidney to develop, so I guess I need introduce the mayonnaise as well. For the nephron to work correctly, its different cell types must be correctly organized; if they are in the wrong order, or if some are missing, the system falls apart. Not much was known about how this organization develops and is controlled. Our paper shows that β-catenin, a signalling molecule that was already known to be important in earlier stages of nephron development, is the driving force in this patterning process. We also show that β-catenin interacts with multiple other signalling pathways and together they ‘program’ this fascinating structure (Lindström et al, 2015). Everything is exciting if you know enough about it. But in this particular case, we found a completely new function for a gene that had already been studied in the developing kidney for a long time. The method we used, using inhibitors, meant we could also very efficiently study how the other pathways required for kidney development interact with this gene. Doing all of this with mutant animal models would have been impossible because of all the breeding involved. Finally, I think the normal and time-lapse imaging that Nils Lindström, the first author on the paper, produced is truly stunning. We’re still studying many aspects of the roles of Wt1 and β-catenin in Wilms’ tumours, including how they interact in the disease. We’re making new mouse models for that, and now we are in The Roslin Institute we have additional possibilities, including generating pig models for these genes and the disease. It turns out to be very difficult to make good Wilms’ tumour mouse models in mice, but pigs have larger kidneys and develop slower, which might increase the chances of developing Wilms’ tumours. Pigs are also increasingly believed to be better models for pre-clinical research than mice, and The Roslin Institute is actively developing and optimizing gene editing technology, like CRISPR/Cas9, in pigs and other large animals. 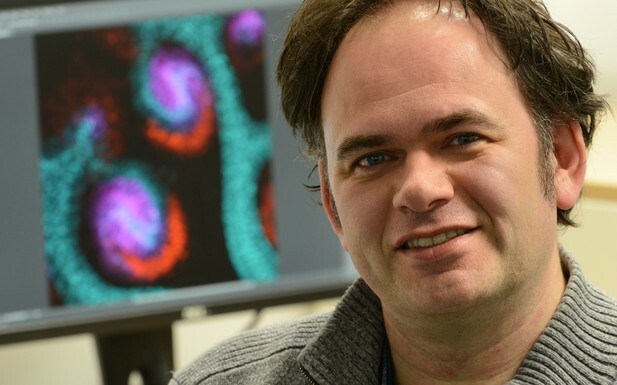 I think this will give us unique opportunities to create pre-clinical models for Wilms’ tumours. We’re also starting to look into the Wilms’ tumour cancer stem cells. Finding germline transmission of my first mouse model. In those days, it could easily take a year to make a targeting construct to insert into embryonic stem cells that could alter particular target genes in mice. Nowadays, you can order these targeted cell clones from a public resource. After 1½ years we knew we had mice being born that indicated the embryonic stem cells had contributed genes to the mice (we could tell that from the coat colour), but running the first PCR test to see if the mice actually passed the mutant version of the gene through the germline was nerve wracking. I couldn’t look at the gel, another PhD student had to do it for me. During my PhD I generated a mouse model for Brca1 (a gene linked to hereditary breast cancer) and at one point I found intestinal tumours in the oldest animals. First I only found them in mutants and not in wild type controls, but eventually I started finding them in the controls as well. We deduced that an extra spontaneous mutation had occurred in the embryonic stem cells used to make the model. This meant all the Brca1 analyses I had done had to be repeated on mice that didn’t have this extra mutation, which we didn’t even know the identity of yet. In the end I found the mutation in a gene called Smad4 and got an extra paper out of it, but it’s not something you want when you’re 3½ years into a PhD. Two people have been indispensable for my development as a scientist. Riccardo Fodde, my PhD supervisor, taught me the power of good, well-designed mouse models and also how to run a lab where people work hard simply because they like being there. Nick Hastie, with who I worked at the MRC Human Genetics Unit in Edinburgh until I moved to Roslin, taught me to go after the big questions in whatever you’re interested in and not to settle for doing things simply because you know how to do them. He also gave me the perfect opportunity to expand my own interests into complete projects that I could take with me to Roslin to hit the ground running. Both of them taught me that perhaps the most important thing for surviving in science is to have fun in your work and do what you do because you enjoy it. Being good should be enough to get that first position, but it’s not. Too much is dependent on factors out of your control, as well as pure luck. I had my fair share of luck, but it shouldn’t be dependent on that. Everybody already complains about it, but the way the peer-reviewing system has gotten out of control, both for papers and grants, is becoming counter-productive for science. Being the best available system is not an excuse not to improve things. Different journals are trying interesting things, and hopefully this will also eventually improve things at the big journals. Too many young scientists are simply giving up because of the system, and that’s a lot of talent and investment wasted. Which new approaches to peer review have you seen that improve on the current system? Publishing the reviewers’ comments and author responses online with the paper is important, and there is clearly a place for journals like PLoS One and Sci Rep that strictly review for scientific/technical validity. For me, the best thing since sliced bread for publishing a scientific paper was the clear, concise list of essential additions to the first version of our paper that we got from eLife. Is your spouse/partner/significant other a scientist? Thank goodness no. She keeps me in the real world. She studied literature and now works, with scientists, in grant administration. Reading science fiction and fantasy, music, photography if the weather isn’t too bad. Yes, but nothing gets between me and reading my daughter her bed-time story. Wherever my science and questions take me. For someone who just published a paper in eLife that leans heavily on high-quality imaging and quantitative analysis of these data I understand surprisingly little about how modern microscopes work. Luckily the people in my group do. I only have to think of what we could get out of the data. If you could commission eLife to interview a scientist who you want other early career researchers to be inspired by – who would you nominate and why? Sydney Brenner. I recently saw him speak (although unfortunately I didn’t have a chance to talk to him). It was an amazing and entertaining talk (without slides). One of the things he mentioned was how he and some fellow students drove from Oxford to Cambridge to see the DNA model that Watson and Crick had made (before the structure had been published). It made me realize there are only a few people left who were at the beginning of this whole genetics revolution who are still active. They have a unique perspective on the field and can be more outspoken about it than most other people.